Despite having left Laramie in May 1998, time has not dulled my emotional connection to Wyoming. At my gym, I am the only person with a bag full of Wyoming Cowboy duds. Considering I live in Germany, this isn’t a big surprise. In 2004, after receiving an offer that I couldn’t refuse, I moved to Germany. I became a foreigner in a foreign land – an expatriate, but not an ex-patriot. To Germans, Wyoming is an exotic, faraway place, a living Hollywood western from the 1950s. A place of myth and legend – crawling with bears – all supported by the tales that I tell of my years in Wyoming. Most are true, but my favorite is a wee bit tall. I concocted it for a wide-eyed German colleague. One day, in a serious voice, I explained to him that I was looking forward to my upcoming vacation because Wyoming steakhouses are amazing: it is a lot like going to a fine seafood restaurant. You know how when you walk in the door and there’s a tank with lobsters – then you pick the lobster you want and it’s taken straight to the kitchen and cooked for you? I told him that in Wyoming, there’s a barn with cattle next to every steakhouse and that before you take a seat, you point out to the seating hostess which one you would like for dinner. I tell so many Wyoming stories that despite the fact that I spent the first 18 years of my life growing up in Denver, many of my closest friends are under the impression that I was actually born and raised in Wyoming. I spent six years at the University of Wyoming earning a Bachelor’s and Master’s in Political Science, both with an Environment and Natural Resources emphasis. I reveled in my time at UW, writing a column for the Branding Iron and taking classes like Federal Land Policy and Reclaiming Drastically Disturbed Range Land. 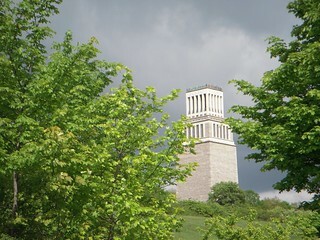 The Buchenwald Memorial, as seen from the grounds of Buchenwald. Getting settled into Weimar, my new home in the rural German state of Thüringen, took a great deal of effort. I struggled with a new language and with simple every day transactions: “ein Bier, bitte!” All that paled to the hardest thing I had to get used to. Looking out my kitchen window, I could see the memorial for Buchenwald, the infamous World War II Concentration Camp. Buchenwald is a place where Jews, Gypsies, homosexuals, and other “undesirables” were sent to work under slave-labor conditions for the Nazis. Visiting Buchenwald, one passes through the gate that announces, “Jedem das Seine” – which translated figuratively means “everyone gets what they deserve.” The barbed wire and guard towers around the camp were designed to ensure that the involuntary residents stayed inside. Touring Buchenwald is a draining experience and after walking its barren grounds, one is disheartened, ready for a good cry and a stiff drink. After one of my visits, I sat on a friend’s porch and mused a bit about Wyoming and how, during that same era, Americans had put up barbed wire and guard towers around involuntary residents. It was this connection that triggered my 2009 Wyoming vacation. I arrived in Cody during a surprise October blizzard. Heading north from the Irma Hotel and struggling with roads that shifted in the blowing snow, I overshot and had to make a U-turn in Ralston. Driving slowly and looking more carefully, I found my destination. 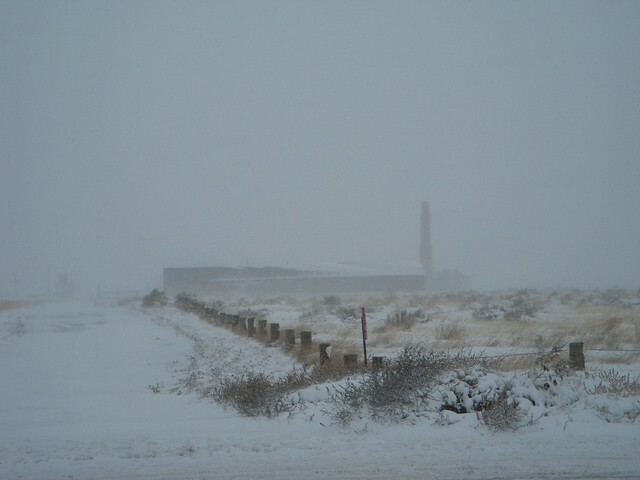 The Heart Mountain Relocation Center Hospital. Heart Mountain is a place where the US government willfully deposited over 10,000 “undesirable” American citizens of Japanese descent for three years during World War II. These Americans were forced to move away from their west coast homes because it was assumed that their Japanese heritage prevented them from being loyal US citizens. Given minimal notice of their impending relocation, these citizens were forced to sell their property at bargain basement prices and take only what they could fit in their luggage as trains hauled them east, away from the west coast. 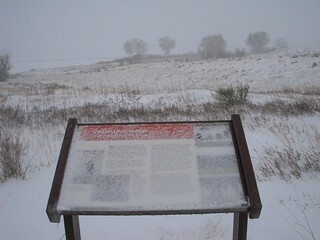 Information at the Heart Mountain Memorial. This one is about the swimming hole. Ensconced back in the warmth of my rental car, staring out the window at the bleak surroundings, it dawned on me that there was no better time to visit Heart Mountain than during this nasty snowstorm. If America had seen fit to pluck its citizens with Japanese ancestry from warm and sunny places like San Diego and Los Angeles in order to store them in makeshift shelters that I suspect even the most rugged of rugged Cowboys would not have found remotely adequate or appropriate, the least I could do was visit the camp when it was at its worst. What struck me the most were the stark similarities in how human beings were treated. Individuals and families forced onto trains, leaving behind belongings, while being shipped to alien, hostile environments. I want to be clear on one point: while Heart Mountain is an outstanding example of heartless behavior by the US government, Buchenwald was a brutal, terrible, murderous place where an estimated 56,000 people were murdered or died under harsh conditions. But the excessive savagery of Buchenwald does not really excuse or minimize the boorish behavior of the American government toward its own citizens. Rather I see value in comparing these places and thinking about history. Although places seem radically different, there are frequently echoes across space and time. Sometimes it is only when people are torn from their homes that we realize what we have today, what we had yesterday, and exactly what we want tomorrow. Relevant Links – In case you’re interested, here are some links relevant to my essay. My blog post, Heart(less) Mountain, covers my thoughts at the time of the trip, including an amazing incidence of coincidence. Beautifully done Adam! I love how you captured two places and weaved them together through the politics of remembering. It shows the importance of exhibiting the past that most strive to forget. Was the monologue filmed so that you might one day be able to see the performance? Mateo – I believe it was filmed and otherwise recorded. I do not know when/if/how I will get to see the recorded material.